From Design To Delivery, The Focus Of The Brass Products Division Is Quality And Service. Our Engineering Department Develops Everything From Prototypes, To Product Modifications, To Improvements In Design And Manufacturing Techniques. Utilizing State-of-the-art Technologies, Our Engineers Can Provide A High Level Of Field Support, Including Custom Design Work. parker Brass Has Four Manufacturing Locations - Otsego And Lakeview, Michigan, Kent, Ohio And Albion, Indiana. The Brass Products Division Offers The Rich Heritage Of State-of-the Art Engineering Excellence Coupled With Technical Service For Our Customers. Manufacturing And Assembly Are Performed On Various Types Of Multi-station Automated Equipment. In Addition, Our Custom Manufacturing Department Can Quickly Produce Virtually Any Special Design You May Require. brass Products Division Is Iso 9001:2000 Approved. To Satisfy Environmental Concerns, The Brass Products Division Has A Complete Brass Chip Recovery And Recycling Program. This Also Helps Control The Cost Of Using Highly Recyclable Materials. our Flexible Assembly, Packaging And Shipping Systems Allow Us To Meet Virtually Any Requirement, Including Parts Combined In A "Kit" For Specific Applications, Custom Labeling, And Packaging. 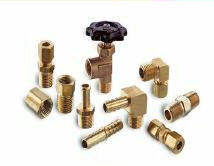 When It Comes To Fittings And Valves, Parker Brass Products Division Is Poised To Provide Premier Customer Service.